FMB parents: Help Needed Tonight! Parents we are on the home stretch but I have had a very bad week with all the things in life that go on. Lisa called me today...telling me that we need painters etc to come help out tonight! We HAVE to have it all done tomorrow night. I am running a child to Columbus State tonight and won't have time to paint. We need to get counters installed etc. PLEASE come out and help out. We all benefit from this building, please come help! I can't beg enough! If you need to get a hold of me you can call or text me at 614-306-4307 I will be away from my computer and can't email back! Thanks so much to Maria for helping me out with the video! flag routine from Fairbanks Band on Vimeo. flag routine (rear) from Fairbanks Band on Vimeo. -Dress is FULL UNIFORM. No visible jewelry please. Ladies: long hair should be up. All members should have crew length (or longer) black socks and Drillmaster shoes. First pair of gloves is free...replacements are $2 and must be paid for in cash. You are to be in full uniform at all times unless permission is given to take off gloves/gauntlets/coats, etc. -The band room will NOT be open from 3:00-5:00. Supervision will not be provided. Go home. Rest. Get some food. Be ready to rehearse at school at 5:15. Great job tonight, FMB! Meet the Teams was a step in the right direction. Home opener on Friday night! Pictures from tonight have been posted on the picture page. -Dress is SUMMER UNIFORM. No visible jewelry please. Ladies: long hair should be up. -The band room will NOT be open from 3:00-5:00. Supervision will not be provided. Go home. Rest. Get some food. Be ready to rehearse at school at 5:30. 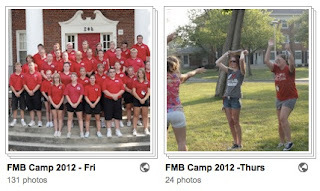 The FMB will perform at "meet the teams" night at Kyre field on Thursday, August 23. Dress is Summer uniform. We will warm up at 7pm at Harmony field and perform at 7:25 at the stadium. We will play the SSB and march/play part 1 of the show. Attendance is required for members. Everything will be done by 8pm. Parents: Come out and meet all the FHS band members and all the fall sports teams! a feeling of deep pleasure or satisfaction derived from achievements, qualities, or possessions that do one credit. 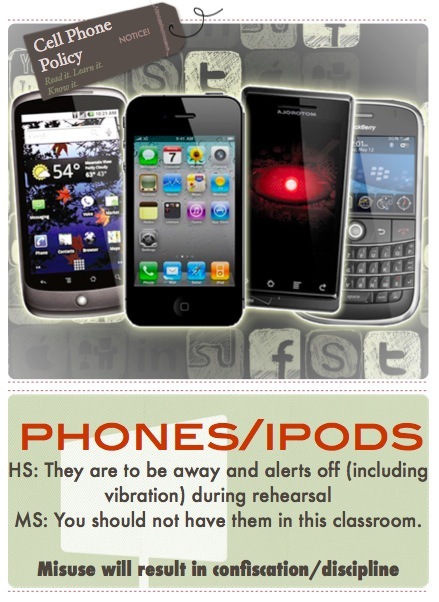 The band room cell phone policy will be strictly enforced. Did you know that the calendar of events is interactive? Click on an event and you'll get more information. Events are updated as they draw nearer with departure times, return times, and uniform requirements. Check it out! 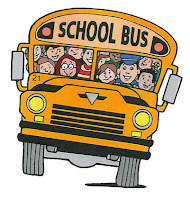 Welcome to the 2012-2013 school year! I'm excited to get started and look forward to seeing you all this week. 6th grade band members do not need instruments their first day of class. 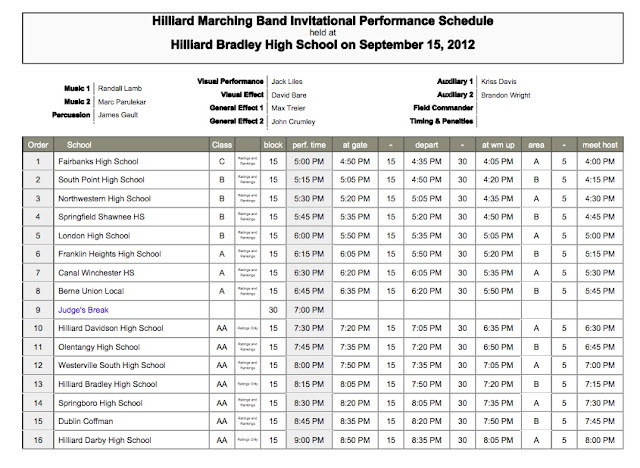 6th band will meet on an A,B,C rotation. JH Band members (except for FMB members) will not need their instrument on the first day of school. 6th and 7th grade general music students will need to bring a pocket folder and a pencil to their first day of class. 7th general is in four sections and meet for an entire nine weeks. 6th general is in three sections and are on an A,B,C rotation. 1. 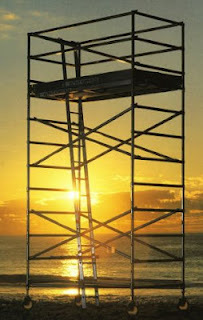 Each class will decorate Mr. Keller's scaffold at the assigned home game. 2. 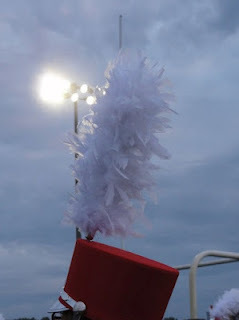 Decorations and signs should be fun, positive, and full of FMB spirit! 3. Students are responsible for cleaning up their decorations on Monday immediately following the game. 4. Each class will be given $15 to defray the cost of their decorating. Any expenses above and beyond that should be shared by the class members. Please don't go overboard. A sheet, some markers, and some crepe paper are pretty cheap. Be creative, but be thrifty. 5. At the end of the season, the class with the best decoration will receive a prize! 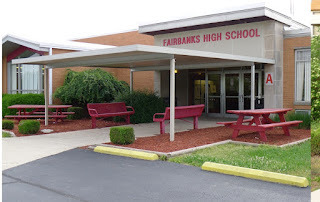 There is a $40 fee for participation in the Fairbanks Marching Band. This money is spent on several things including (mostly) transportation, uniform care and maintenance, music, and equipment like drum sticks, flags, and the like. All band members need to pay this fee to Mrs. Reed in the high school office. If you are a Tolles or PSEO student not registered for band, or an 8th grade member of the FMB, please pay this fee as soon as you can if you have not already done so. 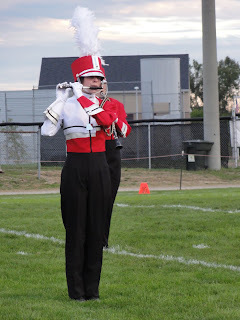 Uniform fittings for FMB members will be on Monday, August 20, from 9-am to noon in the band room. Members may come in at their convenience during this time. As that day is now a teacher work day, there will be no rehearsal that morning. If you are unable to make it during this time, you will need to stay after rehearsal at 5:15 on Wednesday, August 22 to get fitted. EVERYONE must be fitted for a uniform by this time as we may be wearing our full uniform on Friday, August 24 if the weather permits. 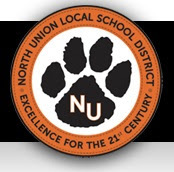 Uniform rules and regulations are listed in the Band Student Handbook and will be strictly enforced. We have some wonderful and good looking uniforms....we need to make them last a decade or longer! We have been approved and are moving forward with the band building on the field. Lisa and Mike Voit will be up on the field Wednesday evening at 6:00 pm to move gravel, poor footers etc...anyone available to come help out that would be awesome! 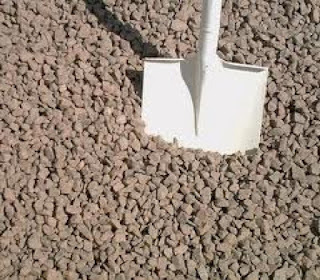 She mentioned a bob cat or machine to push the gravel around. If anyone has please let me know. This has been a hard process but will be well worth it! Thanks in advance!! See ya next Thursday night for MEET THE TEAMS! 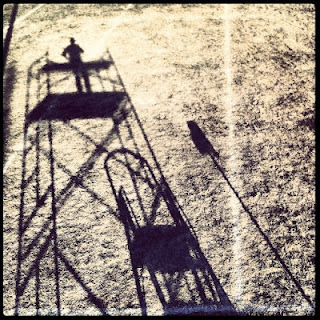 If you're not following the Fairbanks Band Twitter, then you should. You do not have to sign up for Twitter to view our updates. Just go to http://twitter.com/fairbanksband and you can see all of my posts. However, if you do sign up for Twitter, you can stay even more in-the-know. 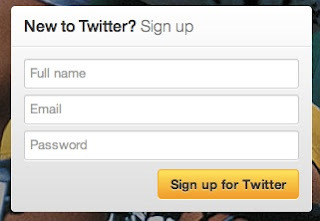 Go to Twitter.com and sign up with your name, email, and password. 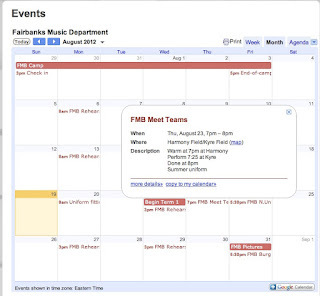 Go to twitter.com/fairbanksband and click "follow" at the top of the page. Here's how to sign up for mobile updates. Go to the menu in the top right hand corner and select "settings". In the menu on the left, click "Mobile" to go to the twitter mobile preferences. Enter your cell phone number and activate your phone. I finally got pictures from Thursday and Friday up on the picture page. Check em out! All band members and parents need to read and understand their responsibilities for the smooth operation of the Fairbanks Band program. Please click the links and read the material. If you have any questions, please do not hesitate to contact me at bkeller@fairbanks.k12.oh.us. My band policies have been consistent for nearly two decades and I believe they are very productive and fair to all members. Students are responsible for these rules and policies for the entire school year. 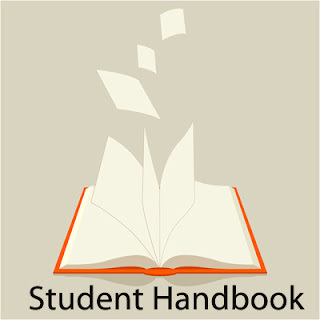 It is not necessary to return a handbook form this year. Click the link below to view the handbook page. It has been a great week for the bandos at camp this week. Was up there yesterday and was impressed on their progress. Mr. Keller has done an excellent job this week with them. Hope to see you all there this evening at 5:00 pm for the end of show performance. Just a reminder. I will be up on the patio outside where you checked in for band camp to do the check out after the show. We need to have your child make sure their room is cleaned and that they return the meal pass and key that was assigned to them along with the lanyard back to me. I will give them their copy of the invoice that shows they correctly checked out. if not they will owe the $25.00 per meal/key to the college to replace. Please make sure you find me.